The ORCHID Hair Pin is a lovely pin for the bride who’s looking for something a little subtle. Based on our best selling Gyposphila Hair Pins, this lovely little pin adds a gorgeous orchid in 18k gold, rose gold or silver plate. Swirls of freshwater pearls are hand wired alongside the orchid for a beautifully dainty hair pin. 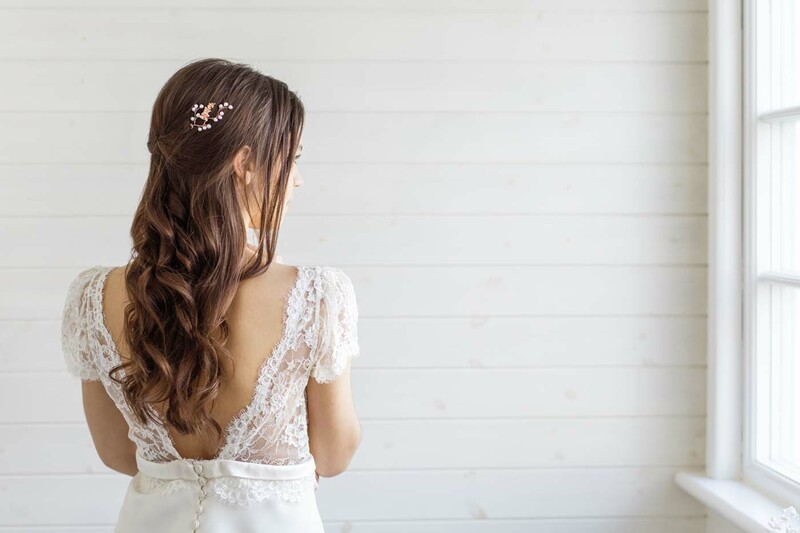 The Orchid Hair Pin would be gorgeous in sets of two or three, and also make a wonderful gift for your bridesmaids as it coordinates so beautifully with many of our other Orchid hair accessories including the Trailing Orchid Floral and Pearl Hair Vine. The DELPHINIUM Hair Pin is the dainty little sister to our Delphinium Hair Vine. Hand formed and enamelled petals in gold, silver or rose gold are perfectly paired with tiny seed bead leaves and little sprays of freshwater pearls. 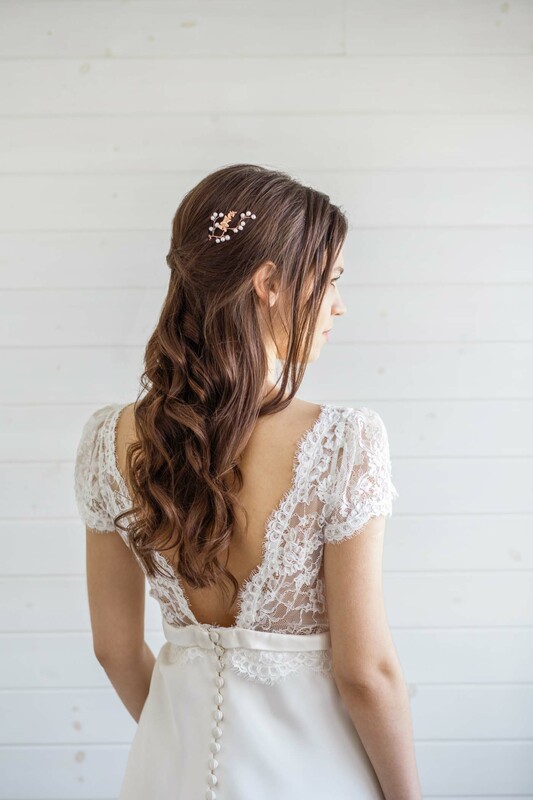 Perfect for brides looking for a small piece to finish off a delicate bridal look. The Delphinium Bridal Hair Pin is also perfect for bridesmaids where the bride is wearing one of our larger enamelled leaf headpieces. 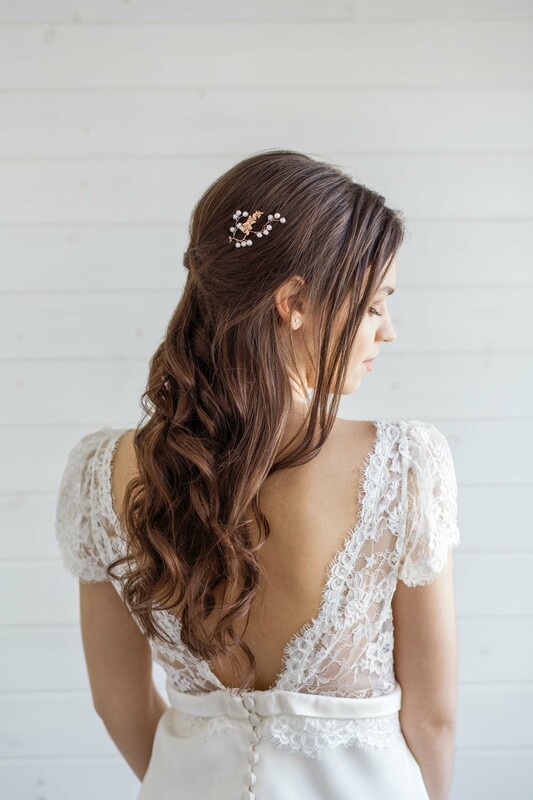 The perfect match to our Flower Queen Rose Tiara, the Flower Queen Rose Hair Pin is a lovely, delicate hair pin that is the perfect finishing touch for brides looking for a small detail to add to their wedding hair style. Composed of hand wired sprays of freshwater pearls and Swarovski crystals along with silver or 16k gold plated orchids, this adornment is set on a silver or gold plated pin to easily and comfortably tuck into your hair. 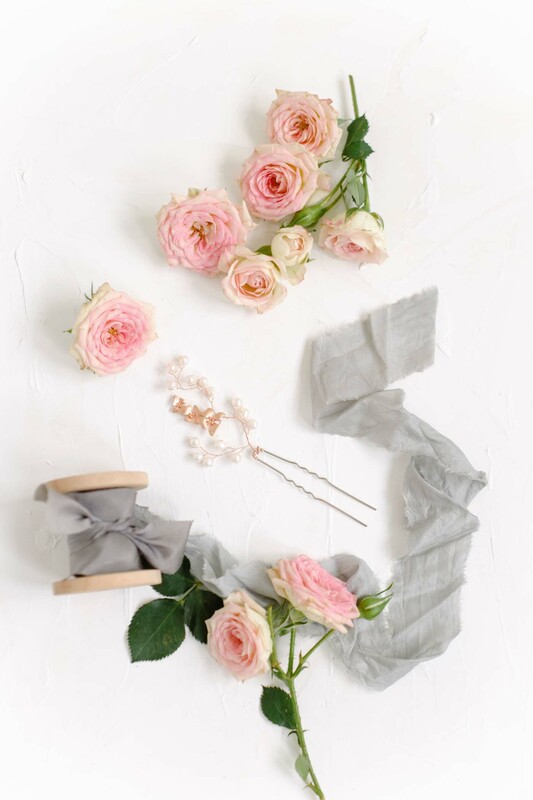 The Flower Queen Rose Hair Pin can be styled as a single pin or in clusters of two or three for more impact and would also make a beautiful adornment for a bridesmaid to match a bride in the Flower Queen Rose Tiara. Available in silver/blush as shown, or silver/ivory, gold/ivory, rose gold/ivory or rose gold/blush. Delicate floral hair pin set with glass flowers and swarovski crystals. Available in gold, silver, rose gold or copper wire with ivory or pale blue glass flowers. The perfect “something blue” for your wedding day. The model is wearing the Gypsophila II Headpiece in copper with ivory pearls. Available in gold, silver, rose gold and copper metal with ivory or blush freshwater pearls.